Oh, how true, how true! 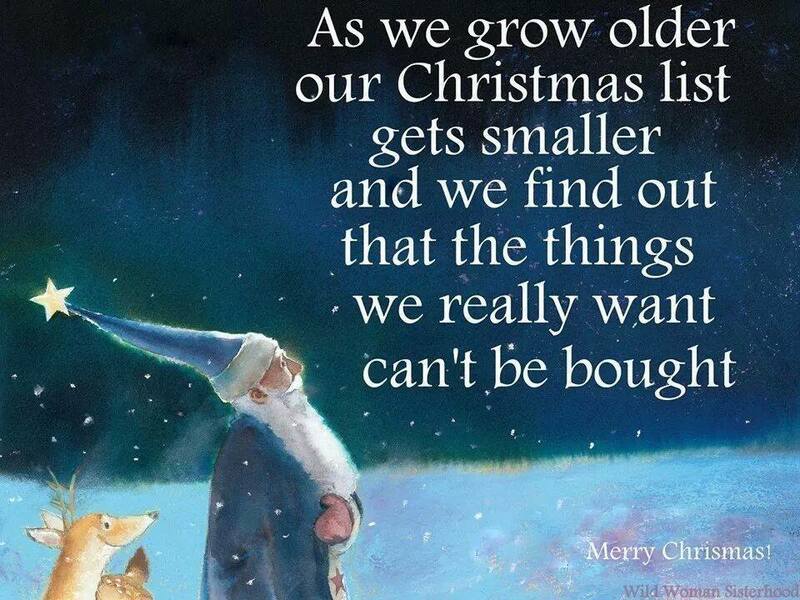 And this message could be a bit melancholic if not for the fact that I can happily say that those “priceless” items that can’t be bought, and which make me very happy, come into my life on a daily basis…not just on Christmas day. The priceless items are the opportunities to learn more and more from this hobby of mine about which I am passionate. 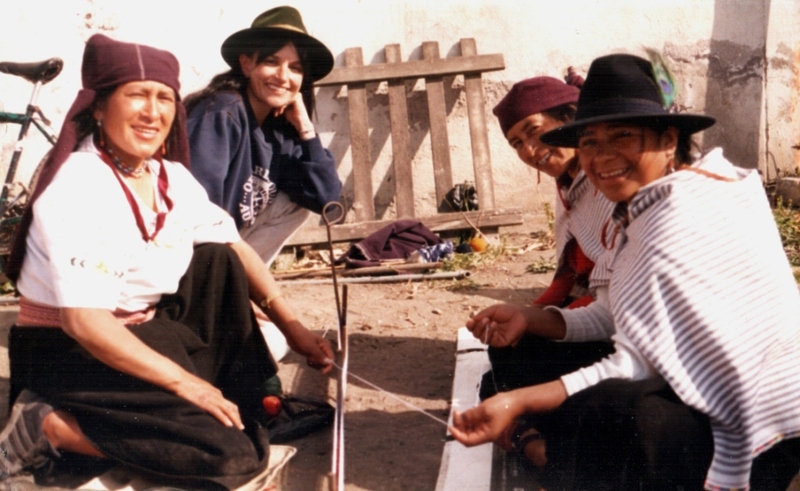 The opportunities come from near and far…from my own experiments at the loom from which I constantly learn….from weavers here in Bolivia as well as from those on the other side of the world. Sometimes they seek me out and sometimes I just stumble across them via the internet. 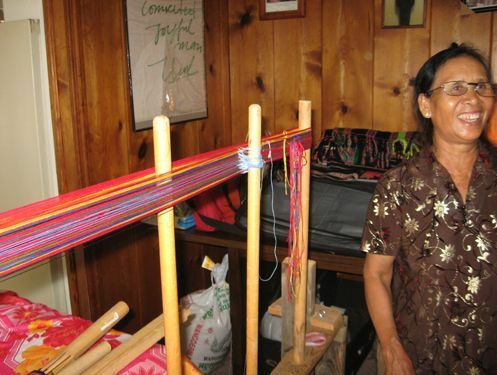 While in Australia, I could hardly contain my excitement over a photo of a backstrap weaver that I ran across online. I patiently waited for a reply from the photographer for permission to show her shot here while boring all the non-weavers around me with news of my find. Here is the image which photographer Jaina Mishra has allowed me to show. 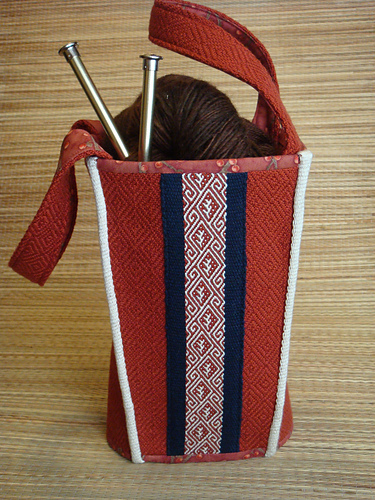 It shows a backstrap weaver from Arunachal Pradesh in northeast India warping with a partner directly onto her backstrap loom…something that I have never seen before (except for the simple narrow toe-and-finger method of warping that I have been taught to do by my teachers here in Bolivia and which Maxima is executing below). 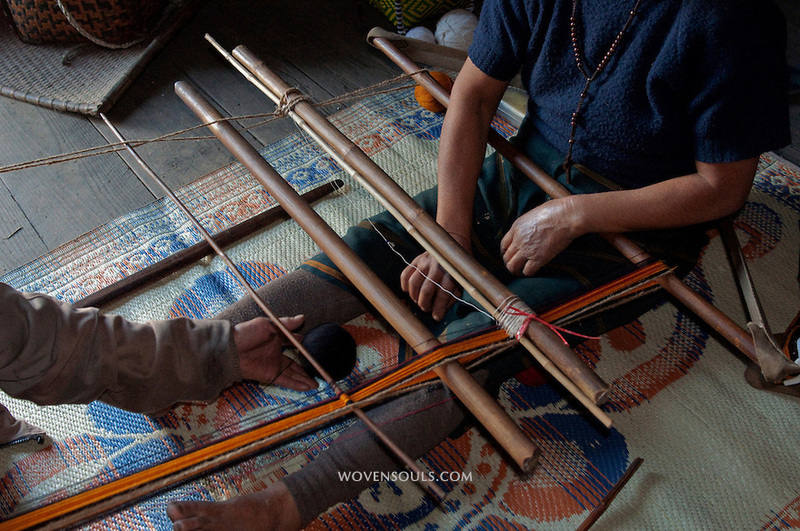 In the picture from Arunachal Pradesh, the heddles are being installed as the two ladies warp. The thicker of the two sticks at the heddles is being used, as far as I can tell, to ensure that each heddle is the same length. However, I have never seen it being done directly onto the loom with the weaver seated in her backstrap as the ladies in Arunachal Pradesh are doing. 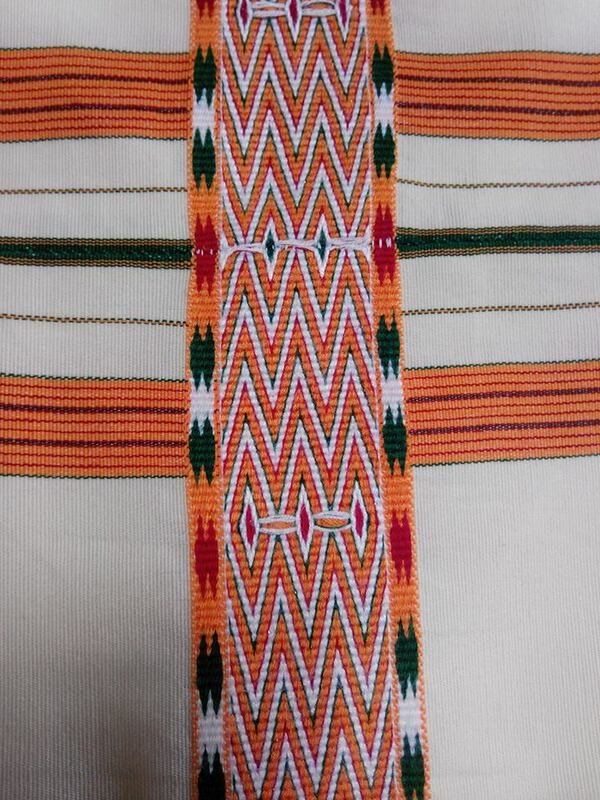 I showed you last week (and here it is again below) a picture of a textile from Arunachal Pradesh that a Facebook friend in India had sent me. I wonder if these ladies are going to be creating something similar. 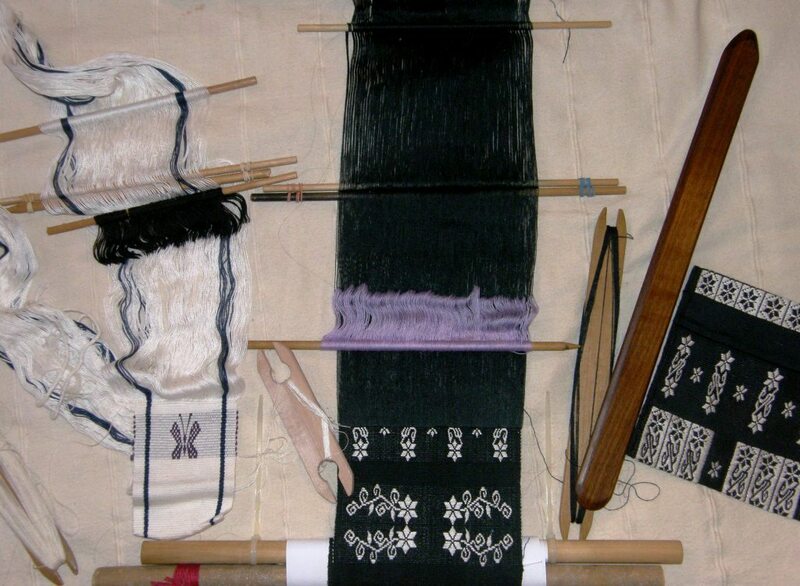 The two ladies sit and pass the ball of yarn back and forth and around the beams and shed rod, while creating the heddles. And they wrap the yarn aound a coil rod! (the farthest stick in the picture from the seated weaver). If you are wondering what in the world a coil rod is, I have written quite a bit about this piece of equipment in other blog posts starting here. I am particularly excited about the presence of the coil rod as the warp that these ladies are creating is on a single plane. 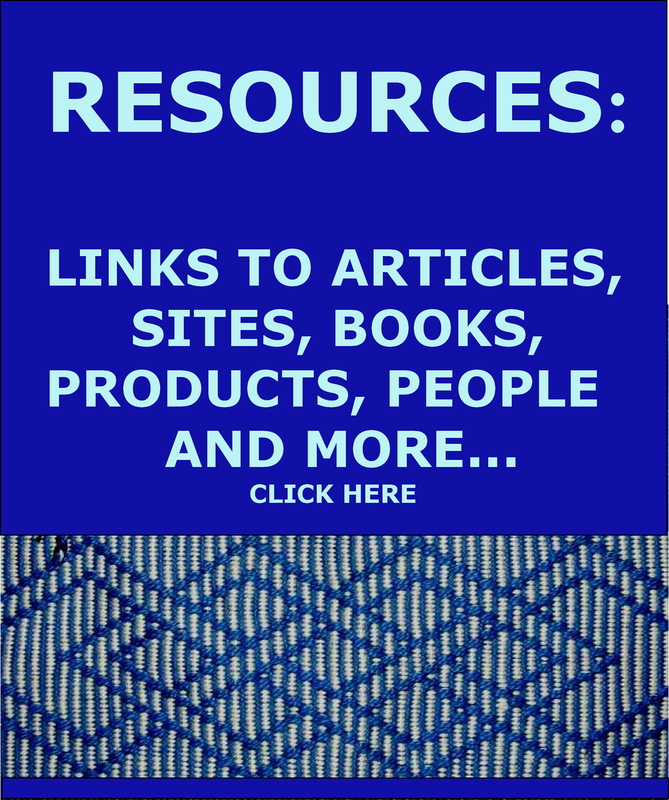 So far, I have only come across a coil rod being used by indigenous backstrap weavers in a circular warp. I used to say that those of us in the Ravelry group who have grown to love the good ol’ coil rod and use one in our single plane warps are being unconventional….maybe we are not so unconventional after all! 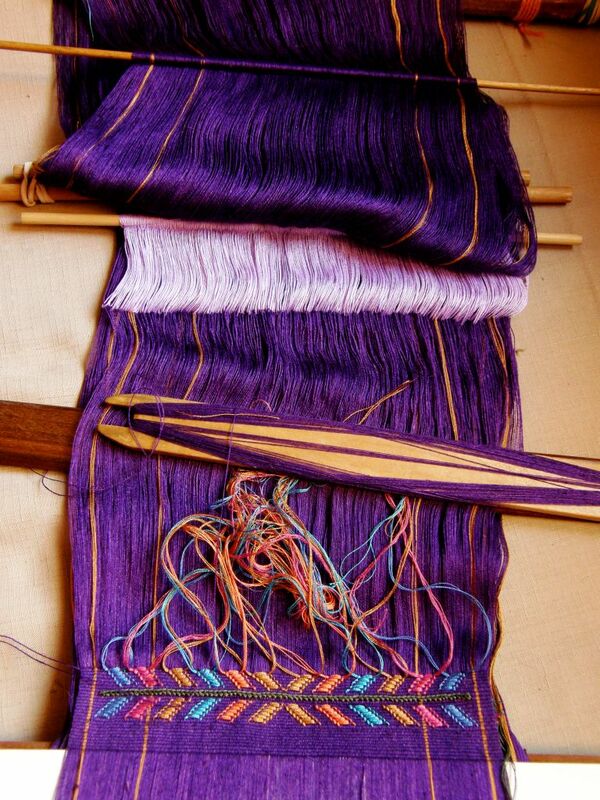 Here is a coil rod installed on Montagnard weaver Ju Nie’s circular warp. This is the first circular warp on which I used a coil rod. The lesson I learned from this exercise was that, when using lots of fine warp ends, the coil rod is tough to move once installed…use a thicker stick. It took two disastrous stick breaks for that to sink in! Since that first experience, I have been using a coil rod on most of my plain weave projects whether the warp be single plane or circular. Here are two projects on which I am working. The black one is a single plane warp and the white piece is circular. The coil rod on each can be seen at the top of the warp. I use the coil rod in single plane warps to help create even tension across the warps at the weaving line and therefore prevent “ridging” or “corrugation” of the woven fabric. Weaving an inch or so at the “wrong” end of the loom before beginning project also prevents ridging but my current preferred method is to use the coil rod. In a circular warp, in my experience, the coil rod has the added benefit of helping to maintain a consistent width. The black piece, by the way, is part of the latest in my red, black and white wall hanging series. The white piece is going to be a little remembrance banner for my mum who loved butterflies and African Violets. So far it has a violet butterfly and I hope to be able to chart and create supplemental weft motifs resembling African Violets. One more thing I love about Jaina Mishra’s picture is the weaver’s backstrap. I like the little pockets at the ends of the straps into which the beam so neatly fits. So much to be enjoyed in one image! 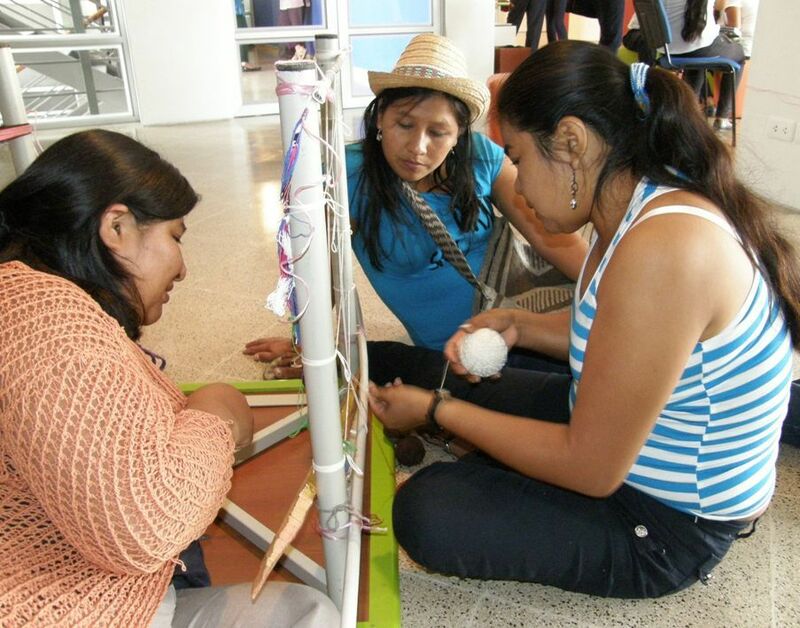 Yes, these opportunities to learn are priceless and it is wonderful to see so many “encuentros” being organized in South America where weavers can gather and learn from each other. Major ones have been arranged in Peru, and there have been minor ones in Bolivia and Argentina. 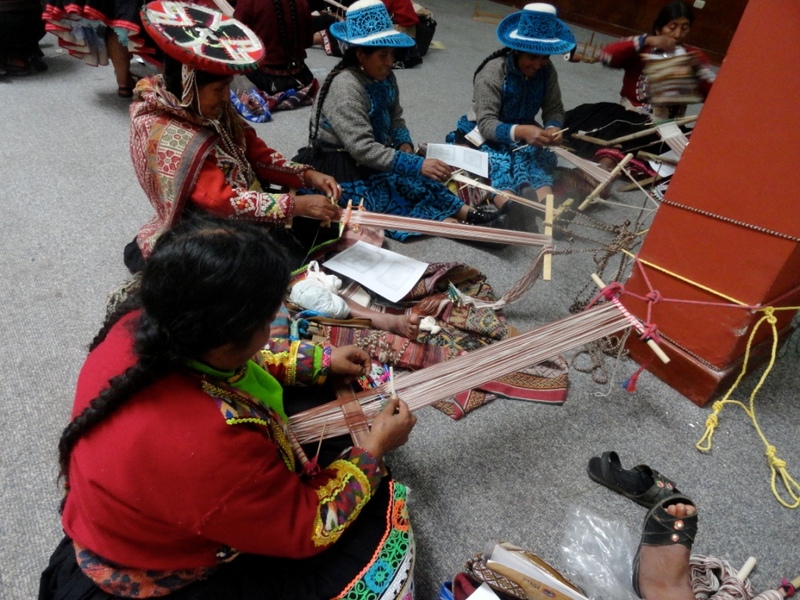 At this gathering in Santa Cruz, Bolivia, my Guaraní weaving teacher got to watch for the first time an Aymara backstrap weaver from Chile and learn the three-color version of the two-color intermesh technique that she weaves on her vertical loom. 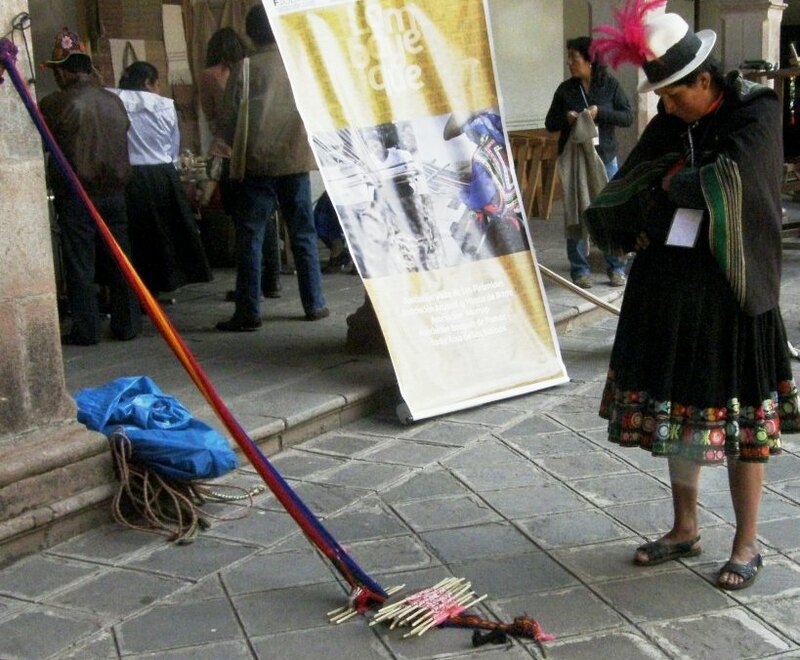 And then a Guaraní weaver shows dovetail warping on a vertical frame to weavers from Chile and Colombia. 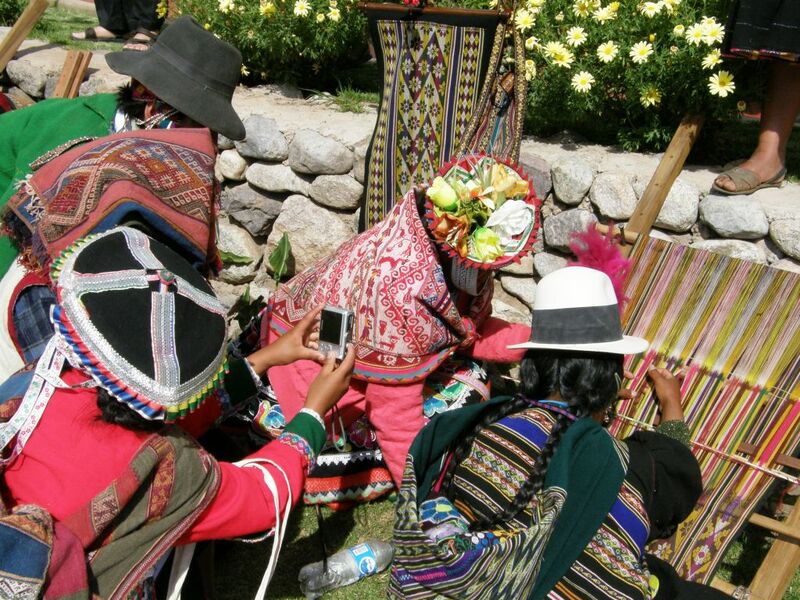 Excited Peruvian backstrap weavers watch and photograph a lady from Tinkipaya, Bolivia weaving on her leaning vertical loom at a gathering of weavers in Peru. Double weave expert Jennifer Moore, from the USA, no doubt learned a lot from the Peruvian weavers with whom she worked at the most recent Tinkuy in Cusco. However, the main purpose of her visit was to teach them balanced double weave pick-up. Here is the class in progress. The picture is from the CTTC’s Facebook page. Below is one of Jennifer’s pictures of her students at work. 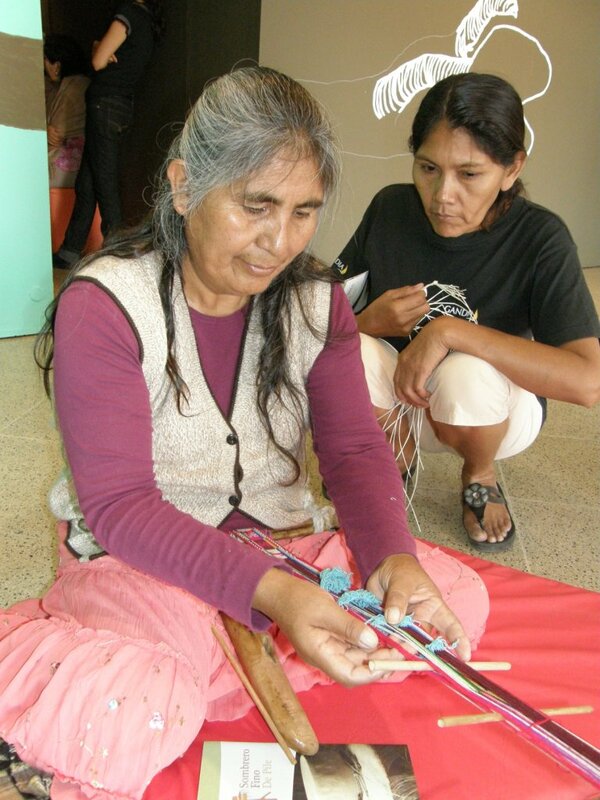 It was an experience that Jennifer described as the highlight of her weaving career. Try putting something like that on your Christmas wish list! 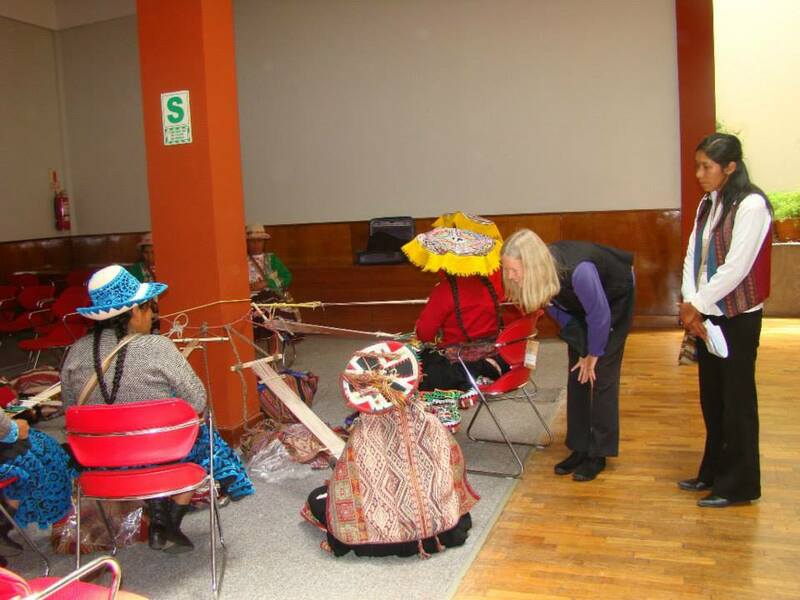 These ladies from Salasaca, Ecuador were eager to learn pebble weave from me. Here we are creating a single plane warp. 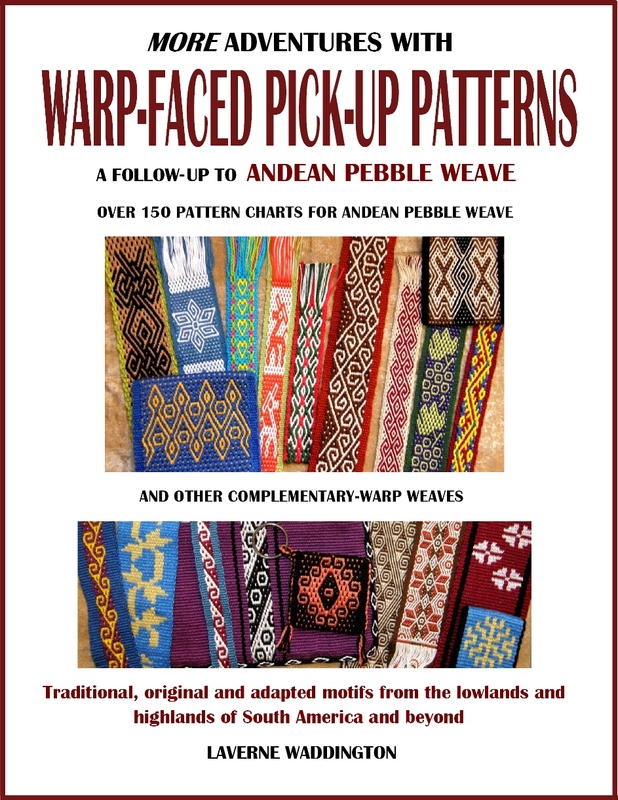 It was only eighteen months later, when their male cousin taught me the Salasaca style of weaving, that I realised how foreign my way of warping must have been to them. They are used to working with circular warps. Teaching them was an experience that I had never expected when I first went to Salasaca and something that money can’t buy. Sometimes the learning is very hands-on. And sometimes just looking in wonder and quietly absorbing is enough….which is why I am so grateful for the images I find and am sent. There is still always so much one can learn and enjoy from a distance. 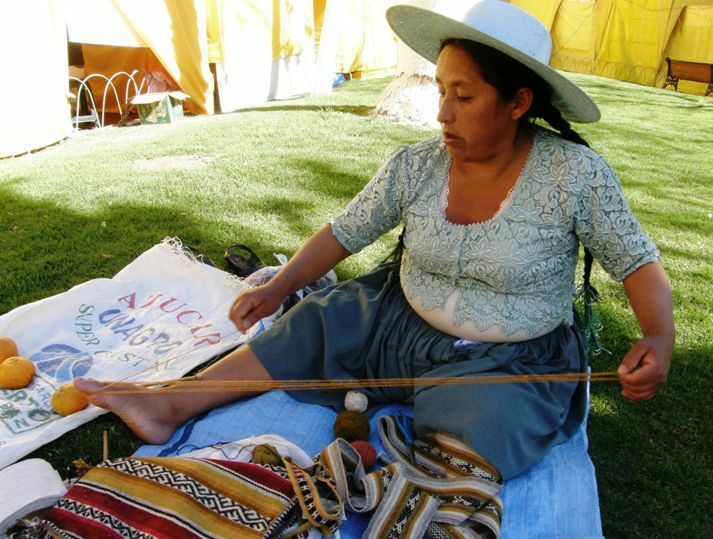 A weaver from Tinkipaya, Bolivia who uses a leaning vertical loom, ponders the 24 sets of string heddles on a Peruvian backstrap loom. 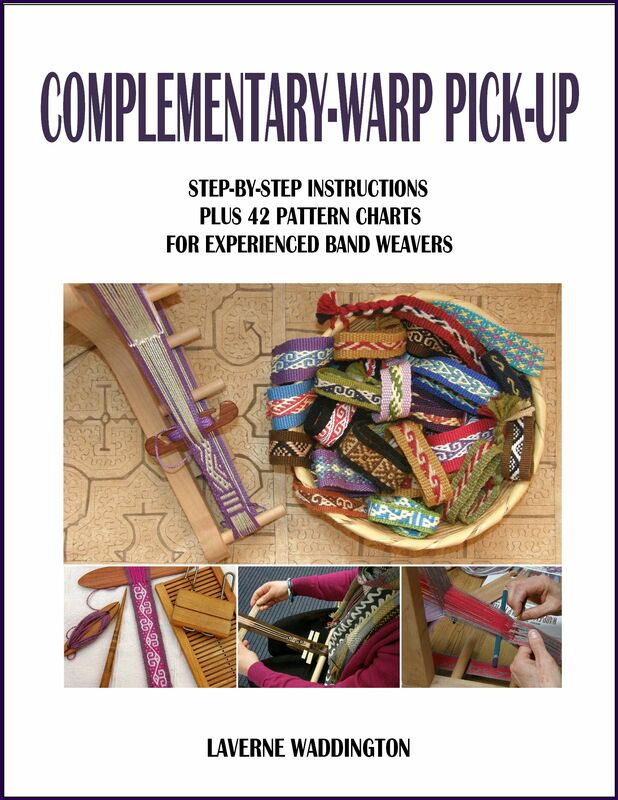 Sometimes the thrill can be about learning something as simple as a new way to make heddles. 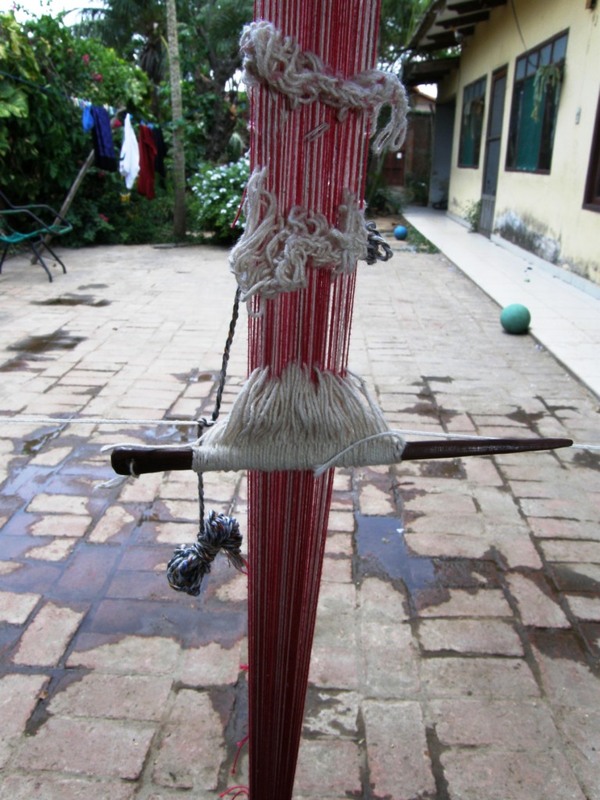 My Guaraní teacher asked me to show her how to make them on a stick. 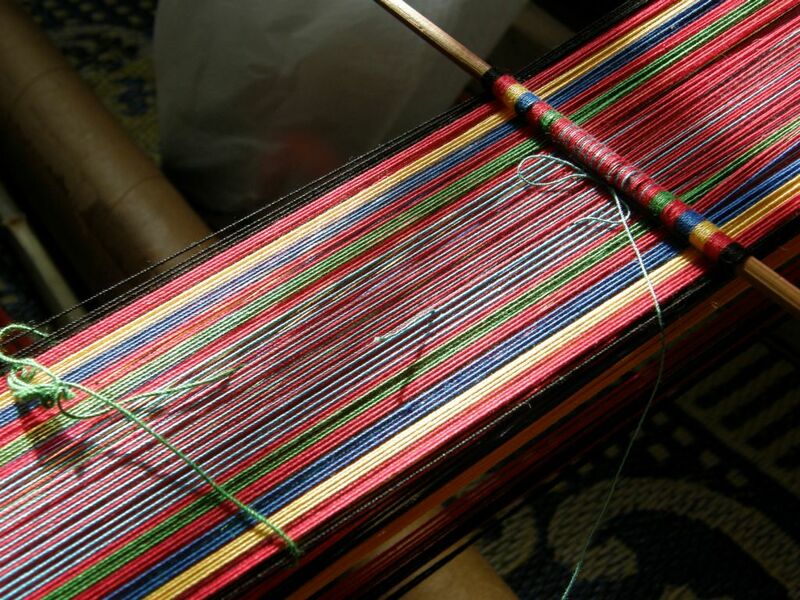 You can see the loose chained heddles higher up in the warp that are traditional in Guaraní weaving. So, now I am home in Bolivia and have unfinished projects to pick up and new ones to contemplate, books to read and maybe even one to start writing. The colors of the Australian landscape as depicted in Austrailan artist Pro Hart’s work give me some ideas on how to perhaps combine the rather pale tones that I have in the dyed yarn (and, yes, the thread still smells like eucalyptus!). 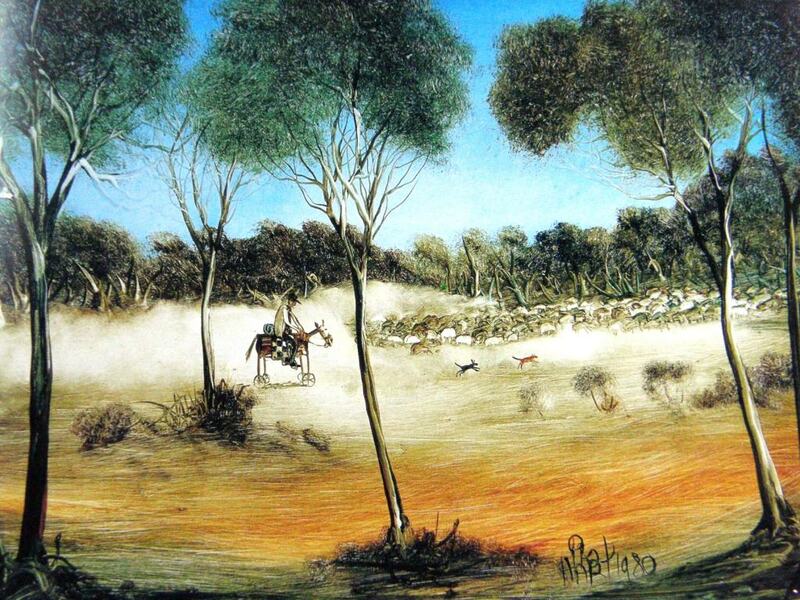 I have a book of Pro Hart paintings that were created to accompany the poetry of Harry “Breaker” Morant, the “horse poet” . The wee bit of homesickness that I am currently experiencing makes me see the “you” in this poem as my home in Australia. You can read the words of the poem here if you are curious about this poet and his work. 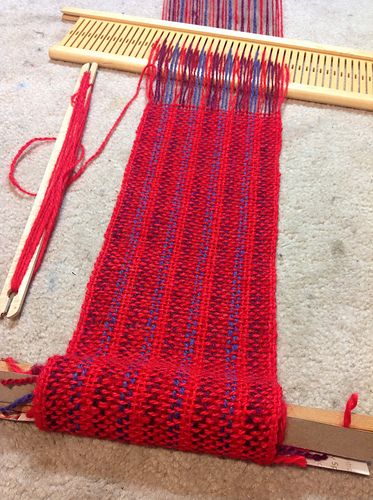 I showed the central pebble weave band on this blog before when Julia first wove it and now she has sewn it onto a piece of twill fabric that she wove on her floor loom in the fabulous rust red. 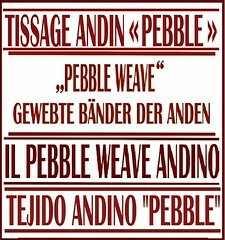 The twill design is the perfect match for the pebble weave band, don’t you think? She has lined the bag and finished it with a tubular band. Teach me to sew like this!!! I taught Lausanne the ñawi awapa when I stayed with her in the fall and look how she has used it! 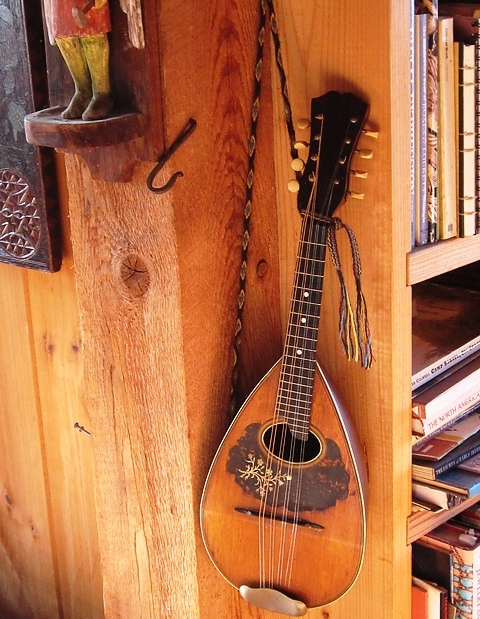 It has made a wonderful strap for her mandolin. I am sure that your eyes are wandering to other intriguing treasures in that picture. Lausanne’s home is full of such things. Jennifer shows us that both threaded-in patterns and pick-up designs make for beautiful pieces of fabric. 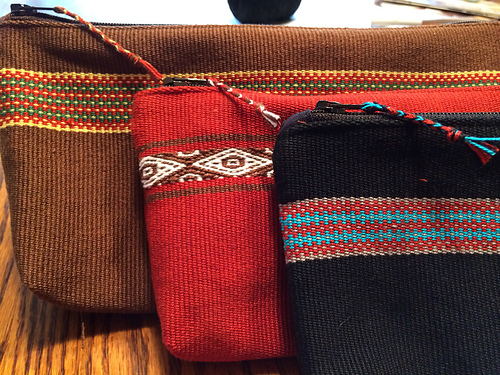 She has made three lovely pouches with braided zipper pulls. 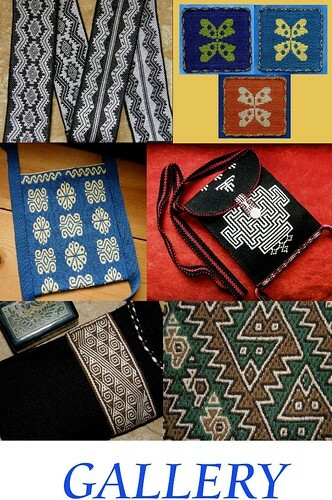 The pick-up pattern she is used is one that I charted from textiles of Tinkipaya, Bolivia which appears in my second book. And to remind us that backstrap weaving doesn’t have to only be about warp-faced fabric, k8black in the Ravelry group showed us her clasped weft scarf. 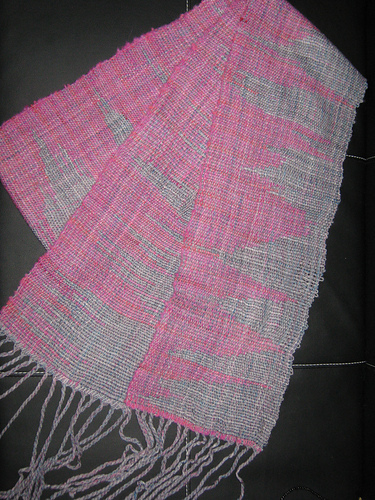 I love the feathered effect in the pink weft. Judy Kavanagh has also been creating balanced weave pieces on her backstrap loom with the aid of a rigid heddle…a few bits of wood and a rigid heddle is all she needs to create this gorgeous scarf. The next piece of work is not backstrap weaving but I want to show it to you as I have shown this project in progress before on this blog. 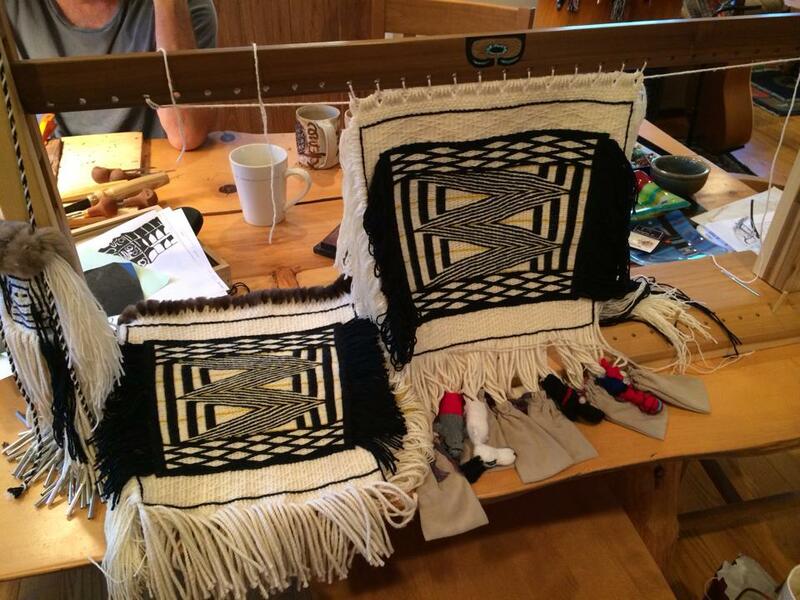 This is what Yonat was working on during two of my visits to Santa Cruz California and is the result of a class in Ravenstail twining that she took with expert Cheryl Samuel. Here are the finished leggings! I would say that Yonat is the person who has woven more with me than anyone so far. Now I need to come up with something to challenge this talented lady on my next visit. Well, the jet lag is slowly subsiding after my 50-hour trip back to Bolivia (with about 10 hours of broken sleep along the way) and it is time to get back to the large backstrap projects that I had been missing…holiday over…back to work putting that niggling homesickness for Australia away! See you next week at the usual time. I couldn’t blog yesterday as I was falling asleep at the computer! And a Happy New Year to you all. Thank you again, Laverne for a wonderful blog. A very happy new year to you, from Ann in South Yorkshire, UK. Here’s to much learning in the new year. I have been handspinning my backstrap yarn (naturally colored cotton and alpaca) and I can’t wait to delve into your books. Warping right onto the backstrap loom! I love it. Your remembrance banner for your mother is very touching. 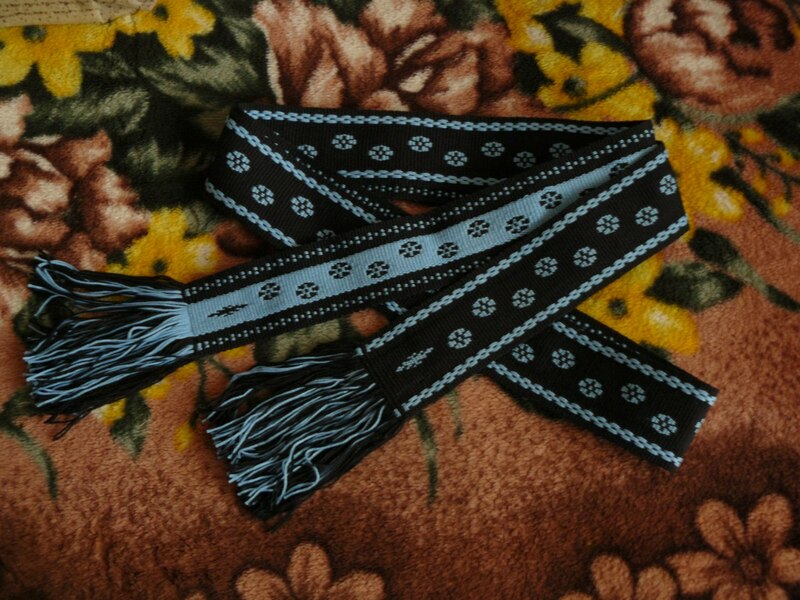 Its seems that warping right onto the back strap loom is more efficient as far as time and energy. It looks like a trip to northern India may be on your list of places to see.